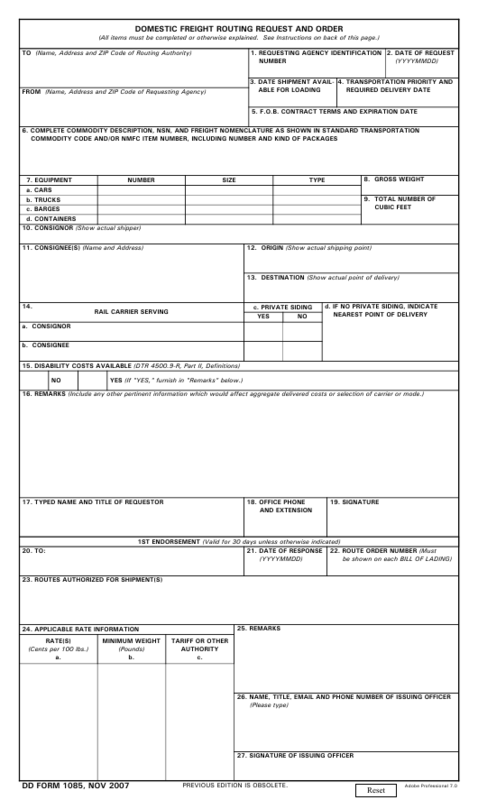 DD Form 1085 - also known as the "Domestic Freight Routing Request And Order" - is a United States Military form issued by the Department of Defense. The form - often incorrectly referred to as the DA form 1085 - was last revised on November 1, 2007. Download an up-to-date fillable PDF version of the DD 1085 below or request a copy through the chain of command. Regulation, Part II, when it is necessary to obtain routings for shipments from SDDC routing offices. carrier's equipment will be entered. 2. DATE OF REQUEST. Enter date of request. 3. DATE SHIPMENT AVAILABLE FOR LOADING. Enter date shipment available for loading. 10. CONSIGNOR. Enter name of actual shipper. accepted by the consignee. (For example, F.O.B. Enter the contract expiration date, if known. of rail carriers serving consignor's facilities, if known. wherever possible for such information. total weight applicable to each rating. c. Indicate if private siding available. initials, and name of town. purposes of mode and carrier selection. same item numbers or sub-description. thereto will be made by using the letters RS or L.
estimate of weight which will be shown in this space. be included in a statement in this item. shipments on Bills of Lading.